Hello Everyone, welcome back to the Stitch Sisters Podcast! If you’re new to us, thank you for giving us a shot! Katy wants to thank everyone who wished her a Happy Birthday and sent positive vibes to send the bronchitis packing! It’s still hanging on for dear life but she’s feeling better than she was. Valerie’s Birthday is June 26th y’all!!!!!! Shower her with love and wishes!!! Knitter’s Frolic – April 25-26, 2015 – Japanese Canadian Culture Centre – Toronto, Ontario – We hope everyone had a great time!!! Stash Dash 2015 – Starts May 22, 2015 and Ends August 14, 2015 – visit the link provided for full rules and instructions on Stash Dash this year! They have 3 levels this year: 3k, 5k & 10k metres. 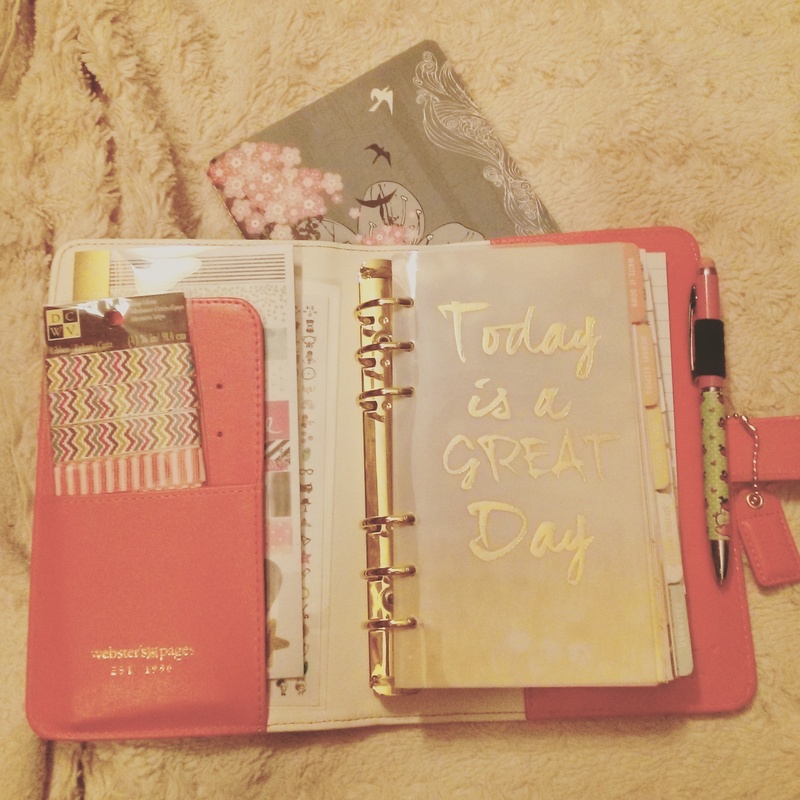 So bust out your wips and raid your stash! You can knit, crochet, spin, and weave your stash into lovely things! Niagara Falls Comicon – June 5-7, 2015 – Scotiabank Convention Centre – Niagara Falls, Ontario – includes guests such as Sean Astin, Billy Dee Williams, Scott Wilson (The Walking Dead), Nichelle Nichols (Star Trek), Kristy Swanson, Colin Baker and Margot Kidder. Katy has finished 1 sleeve on her Mama Vertebrae (HO?) and also finished 1 sock out of Red Heart, Heart & Sole in Spring Stripes and has also almost finished 1 sock out of Red Heart, Heart & Sole in Toasted Almond. Val found a bunch of dishcloths she had finished using various colours of Bernat Handicrafter cotton and added them to her gifting stash. 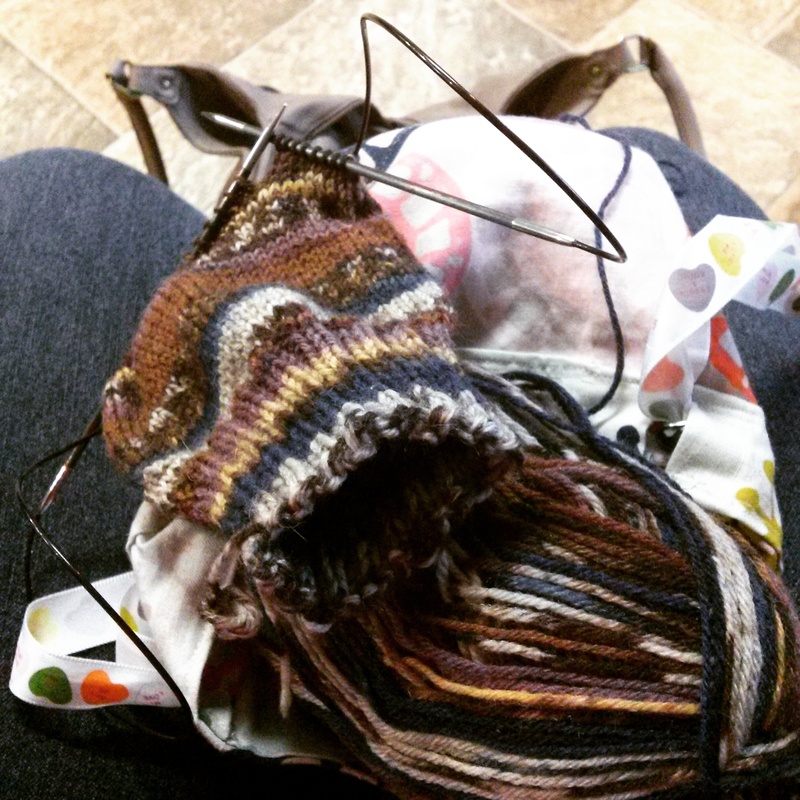 WIPs Val is working on the second Broad Ripple sock using Malabrigo sock in ‘Archangel’ and she is also working on her gorgeous rainbow granny square afghan for her bed! She should be starting the yellow portion very soon! Katy is working on her Mama Vertebrae in Malabrigo Arroyo in ‘Aguas’, she tried to pick up her Outlander MKAL from last year but couldn’t brain. She cast on the Hitofude cardigan using Lindy Chain in ‘Plum’ by KnitPicks and is loving the pattern, very easy to remember and the yarn is lovely! She is also making a small ‘Gateway Cuff’ by Laura Nelkin from her ‘Knockout Knits’ book using the small sweet roll sample from the Wooly Witch in ‘Ice Queen’. Valerie and Katy both need to be less easily enabled by instagram 😉 Valerie wants to go out walking more, and she wants to knit some angry birds plushies for her nephew for Christmas. She also learned that her grandfather used to shear sheep! The old school way with the hand clippers! 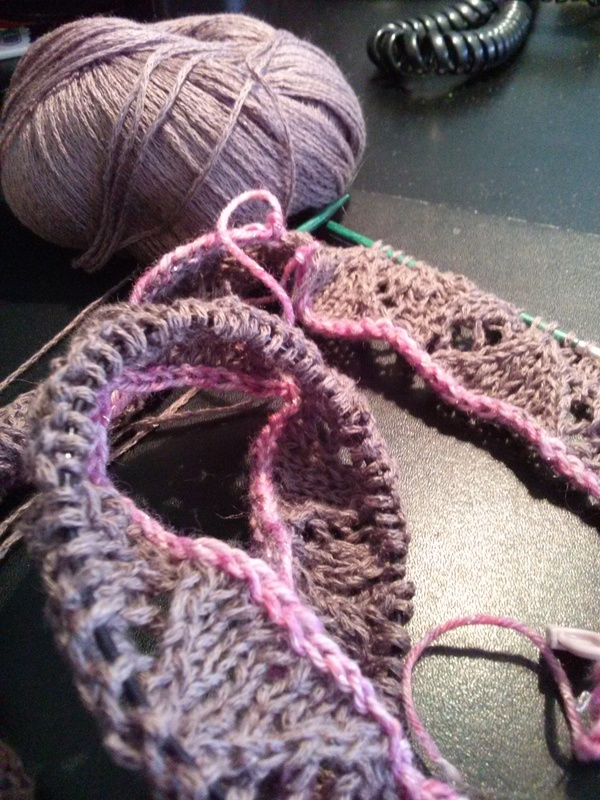 Katy wants to be more organized and she wants to design a simple triangle shawl out of the Peepaloo yarn she bought. Katy learned that 2 at a time socks really aren’t her style, they take too long for her. Valerie was had when she visited A Vivid Yarn Studio on Etsy and saw the colourway Emily! It has beautiful pastel colours with speckles of brown and pink that make it look like a robin’s egg. Very pretty and so stashworthy! Katy spotted (and bought… ahem!) 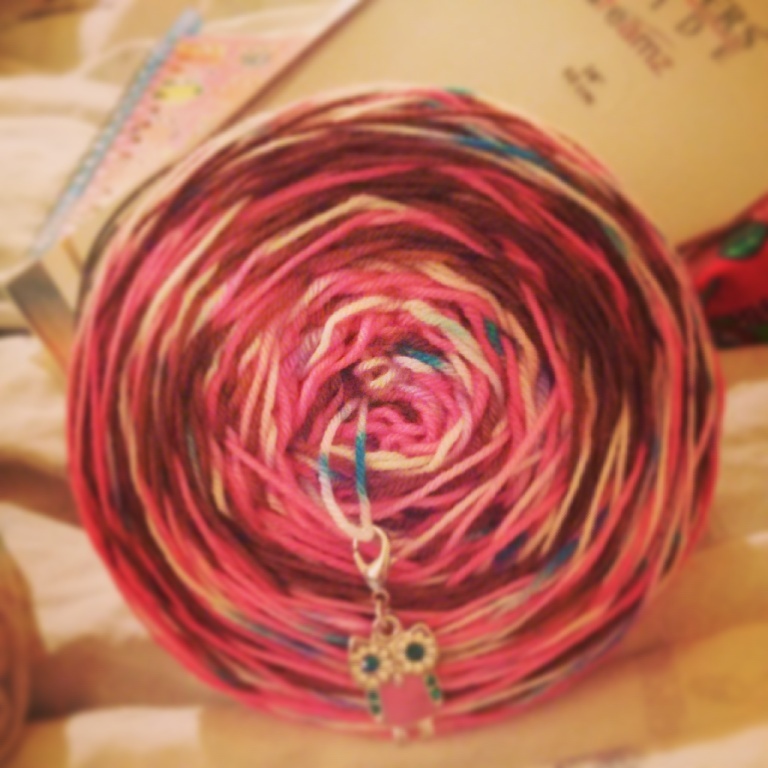 a gorgeous skein of ‘Peepaloo’ from ‘Peepaloo Fields on Etsy. 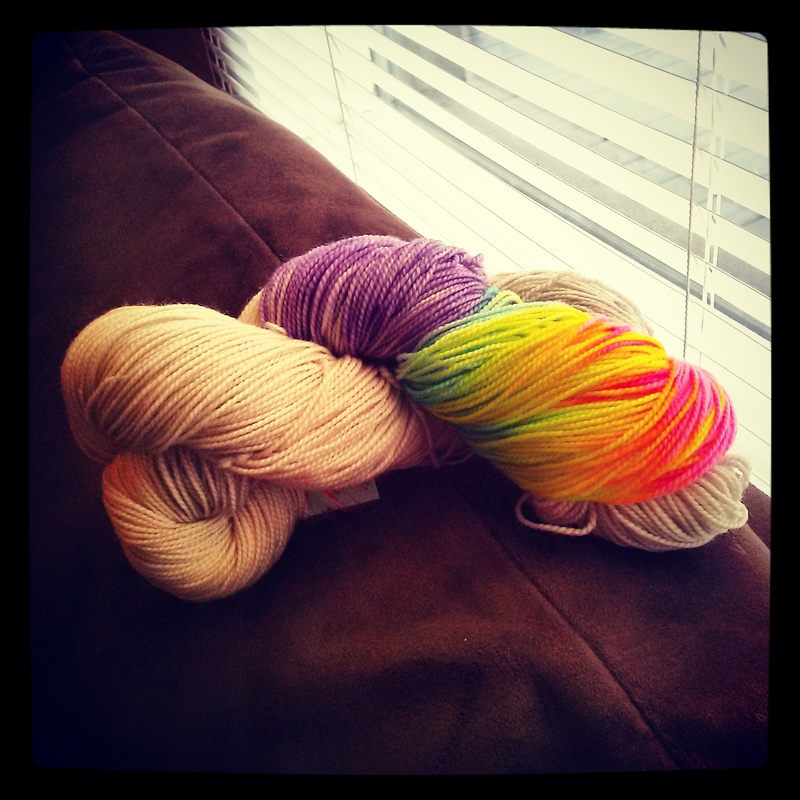 She loved all the rainbows and the 100% superwash merino is so soft! She also loved the colourway ‘Hot Pants’ from Peepaloo fields. The other yarn she needs like air is from Desert Vista Dyeworks, Wonder Woman 4 stripe self-striping yarn! It’s gorgeous!!! 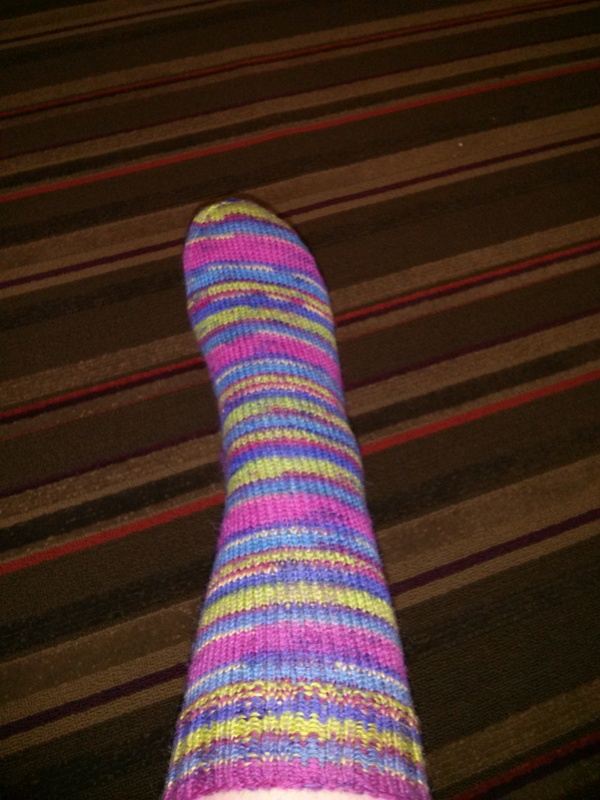 Val picked up some awesome Willow yarn in Gosling ‘Fairy Princess’ to make an awesome pair of socks. The yarn is so soft and colourful. Katy got lots of things for her birthday: The Hobbit: The Battle of Five Armies, some new shorts for work, Willow Yarns Daily DK in ‘Foxglove’ for a sweater, a Webster’s Pages Color Crush Planner in Light Pink, 2 balls of Red Heart – Heart & Sole in ‘Toasted Almond’, 2 AJ Lee Tshirts from the WWE shop, Curls by Hunter Hammersen,, 2 balls of Knitpicks Palette in ‘Huckleberry Heather’ with rainbow beads for the April Shawl, and a Hitofude’s worth of KnitPicks Lindy Chain in ‘Plum’. Val has been watching Outlander and has been trying to keep up with Game of Thrones. She’s also been listening to Dear Future Husband by Meghan Trainor and American Oxygen by Rihanna. Katy’s still reading ‘The Fault in Our Stars’, she’s been watching Outlander, Finding Carter and lots of WWE. She’s been jamming on One Last Time by Arianna Grande and Trouble by Iggy Azalea featuring Jennifer Hudson.